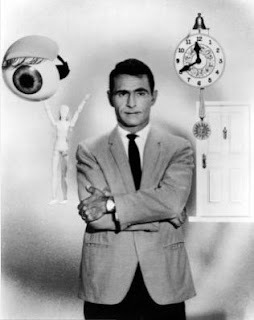 Writing Creatively: Why Do I Keep Finding Myself in a Twilight Zone Episode? Why Do I Keep Finding Myself in a Twilight Zone Episode? After my Writer's Digest win, I decided to join tvwriter.com. So I filled out all of the necessary information, got my user name and password and entered data into my profile. As I worked on my profile, I saw the font getting larger and larger and larger until the fourth word completely consumed the third word, the third word completely consumed the second word, the second word completely consumed the first word, and I couldn't see the rest of the 200 words I'd written. I panicked. I spent the next half hour trying to fix the html code (after all, I am nearly a tenth of the way through my html dummies book – I could figure this out, right?). A half hour later, it was readable, but the spacing wasn't right. I decided, since it was now way past my bed time, that I would live with it. Before I went to sleep, however, I decided that I owed it to myself to at least check around the site and see who else might be on there. That's when time warped. Every single person on the site signed up for it two to three years ago. The day they signed up was apparently also the last day they ever signed on. Would this be my last day on Earth? Or – did I sign up for a club where I was its only member? So I did what any tired writer would do – I went to bed – and prayed for my life. The next morning, still alive, I looked for TVWriter.com and and found a site that did NOT look at all like the site I signed up with the previous night. Time warps are so confusing. Somehow I signed up for an affiliate site that sits in cyberspace, alone – except for maybe in the Twilight Zone. Lol. There's a movie about something like this. It's called the Ring. Creepy. Yet, I'm the most unsuperstitious person ever. Hello, T! The title of this post made me laugh out loud! I can relate! And I liked the post. Very Kafka-esque ... How are you?